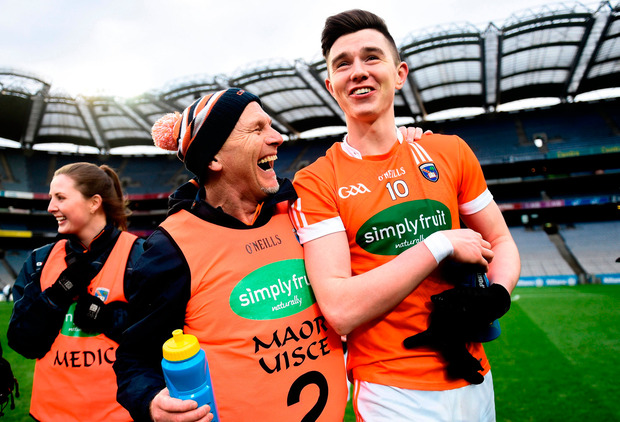 Andrew Murnin capped a Man of the Match performance with the game breaking goal as Armagh claimed the Allianz football league Division 3 title at Croke Park. Full-forward Murnin finished with 1-3 and struck his goal in the 54th minute to give Kieran McGeeney's men a five-point cushion. They required every bit of it as a spirited Fermanagh, who will host Armagh in the Ulster championship at Brewster Park on May 19, pushed them all the way. Fermanagh scored the last three points of the game through sub Tomas Corrigan, Conall Jones and Barry Mulrone to get the gap down to just two points. But time ran out on their bid for a first piece of silverware under Rory Gallagher as Armagh held on. It's the second time in four seasons that Armagh have beaten Fermanagh in the Division 3 decider following their five-point win in 2015. Sean Quigley was a late addition to the Fermanagh attack, wearing number 28, but lasted just five minutes. He was shown a black card and replaced by Ciaran Corrigan in a considerable blow to the Ernersiders' attack. Seamus Quigley picked up the scoring slack in his brother's absence, hitting nine points, and gave an exhibition of first-half free-taking, converting six placed balls out of six. One of those frees won by Declan McCusker who was named in defence but started in attack and asked plenty of questions of Armagh. McCusker also got on the score sheet himself as did Conall Jones who pointed in the 22nd minute to put Fermanagh into a brief 0-5 to 0-4 lead. Fermanagh also led at 0-8 to 0-7 late in the half after Quigley's sixth free though Andrew Murnin tied it up at 0-8 apiece at half-time. That meant both sides had already scored a point apiece more than when they met in Round 6 of the league and drew 0-7 to 0-7. Former Tyrone star Ryan McMenamin was a vocal figure on the Fermanagh sideline as selector and roared out words of encouragement. Armagh fired seven first-half wides though defender Patrick Burns scored one beauty and repeated the feat in the second-half. Armagh opened up with some fine football in the third quarter and a number of point scorers before Murnin grabbed his goal to put them 1-13 to 0-11 up. He capitalised when Gregory McCabe challenged goalkeeper Patrick Cadden for a high ball which broke kindly in front of an empty net. Armagh couldn't quite close it out from there as they wished and it was Fermanagh who finished stronger but they just couldn't reel in the deficit. Scorers - Armagh: A Murnin 1-3, N Grimley 0-4 (0-3f), A Forker 0-2, P Burns 0-2, R McShane 0-2, G McCabe 0-1, B Crealy 0-1, N Rowland 0-1. Armagh: B Hughes; B Donaghy, A McKay, C Macken; P Burns, N Rowland, G McCabe; S Sheridan, C Vernon; B Crealey, A Forker, N Grimley; Rory Grugan, Andrew Murnin, E Rafferty. Subs: R McShane for Vernon (32), G McParland for Rafferty (47), K Dyas for Rowland (60), O MacIomhair for Grugan (70), R Owens for Macken (72). Fermaagh: P Cadden; C Cullen, M Jones, E McHugh; B Mulrone, J McMahon, A Breen; T Clarke, E Donnelly; C McGee, D McCusker, R Jones; Sean Quigley, C Jones, Seamus Quigley. Subs: C Corrigan for Sean Quigley (5, black card), K Connor for McHugh (h/t), D Teague for Clarke (44), T Corrigan for Breen (51), E Maguire for McMahon (63).